My dad is a huge fan of cream-based desserts. He loves all of those creamy fattening desserts such as eclairs, but is a sucker for Wuzetka, which is a Polish cake that has chocolate cake layers on top and bottom and in the middle it’s a very thick cream. He always buys that cake when they go grocery shopping in Polish deli stores. My mom hatess it. The cake is so fattening and it doesn’t really even taste all that good when it’s made in a store anyway. The way we remember it, from Poland, was much much better. Especially when it’s homemade. Well I totally went off track. I’m not even making this cake for Father’s day. I don’t think my culinary experience is high enough to tackle this just yet. One day though, I might. A healthier version, of course. So for today, the cupcakes I made (of course it’s cupcakes, of course, haha) were inspired by Wuzetka. It’s a deep chocolate cupcake with a homemade vanilla pudding filling and a chocolate frosting. While this dessert looks and tastes completely sinful, it really isn’t! 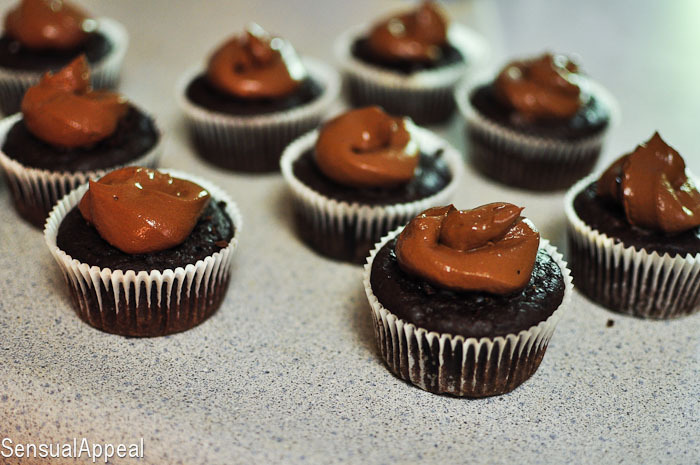 Healthy chocolate frosting tastes just as good as the butter laden one, if not better, and it definitely makes you feel better about eating it guitlessly. 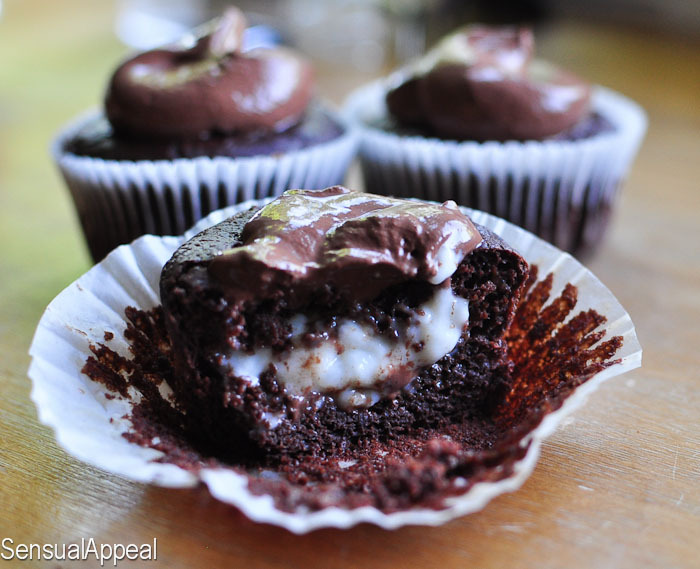 The delicious creamy pudding filling is a wonderful contrast to the deep chocolatey cupcake. The outcome is simply wonderful. Not one person could tell this cupcake had such incredible stats. A cupcake that has 4g of sugar? And only 120 calories for such an amazingly sinful-tasting treat! How’s that for “indulge without the bulge”?! Put 2 cups milk, stevia, and salt in a medium saucepan on a low-medium heat and stir consistently. After it’s been cooking for a while… Put the remaining milk along with water in a glass or small bowl and add potato starch, mix well and set aside. Once the milk and stevia mixture starts to boil, stir the mixture in a glass again so it’s not all thick, and add it to the boiling milk making sure you start stirring it right away and consistently. The mixture will begin to thicken. Stir it until the mixture is thick of the pudding consistency and turn off heat and put it aside for 3 minutes to let it cool. Then stir in the vanilla extract. Cover to avoid pudding forming a skin on top. 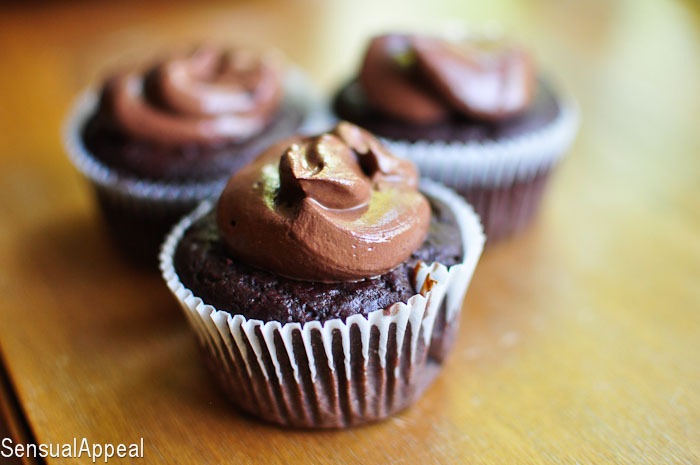 Set aside, in fridge or counter, and make your cupcakes. Note: There will be a lot of pudding left over. If you only want to make the pudding especially for the cupcakes, I’d recommend cutting the recipe by third or even fourth. 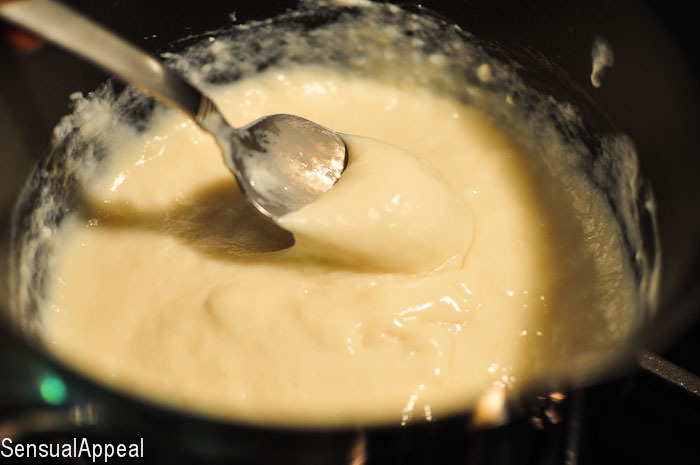 Whisk all of the ingredients together vigorously until it thickens up nicely. Stick in the fridge for at least 30 minutes to help thicken it up a bit more. Frost the cupcakes. Store in fridge. Preheat oven to 350F. Combine dry ingredients in a bowl. In a separate bowl, combine the wet. Add wet to dry and mix, making sure not to overmix though. 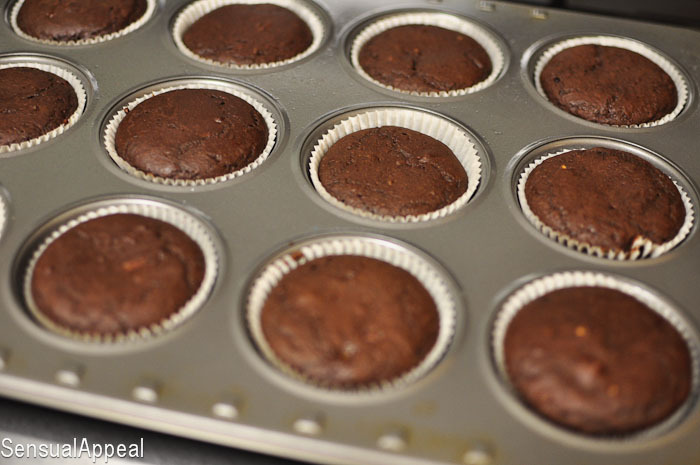 Divide between 11 lined and sprayed cupcake liners in a cupcake tin. Bake for 15-20 minutes. 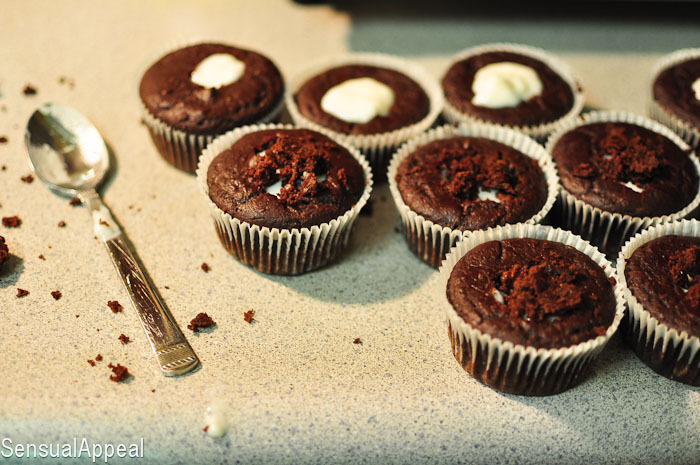 Let cool before poking holes in the middle with an apple corer or a knife, make sure you only go 3/4 of the way (don’t poke all the way through the cupcake). Put pudding in the middle and cover with some of the cake part. 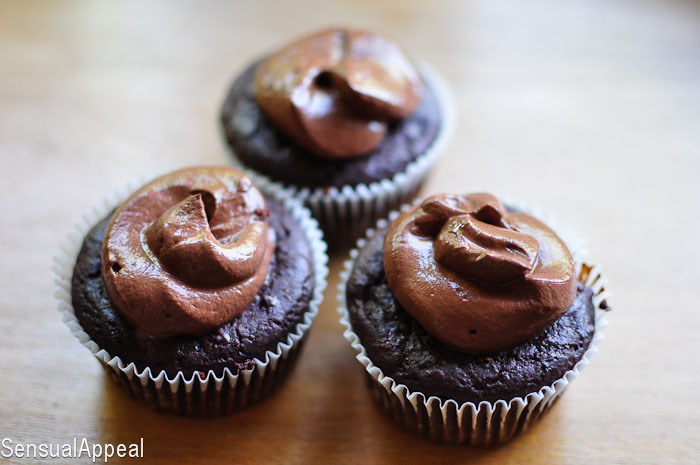 Frost it using the healthy chocolate frosting on top. Store in the fridge. Enjoy! Now go ahead and indulge without any guilt. And go ahead, feed them to your dad (or whoever) and I bet they won’t be able to tell how healthy these are. Enjoy! 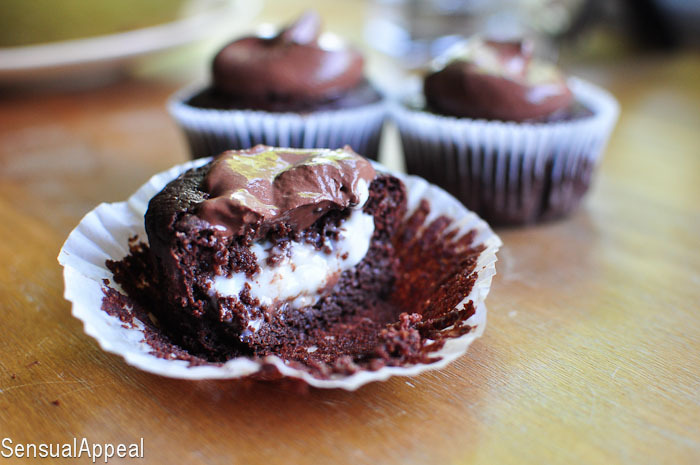 If you could have any filling in a cupcake, what filling would you get? Do you care about calories in desserts? I loved those very much. Delicious… and I would never tell that they are healthy. Thank you Kammie. I could never wish for a better Father’s day surprise. By the way, frozen yogurt was a best possible idea for the day like today. Those look really rather delicious – what nice cupcakes. I really like your idea of using yoghurt for frosting. I’m not sure we can get chocolate stevia in the UK, I might need to experiment! You could just use unflavored or vanilla stevia drops as well, I get mine online. I HIGHLY recommend it 🙂 Let me know when you do! I think this might be my biggest culinary accomplishment so far. With the flavor and the nutritional stats. Wow, yes. This has made my Monday! Stevia is actually a wonderful sweets subsitute. It should not cause tooth decay and best of all, it can not cause obesity and diabetic issues. Just fantastic. Thanks for linking it in.